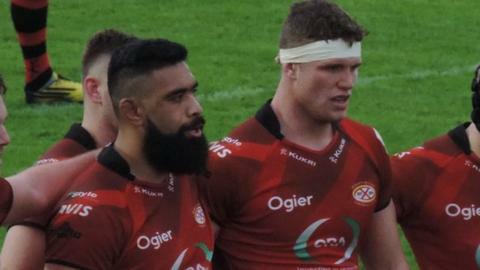 Jersey head coach Harvey Biljon says new signings Uili Kolo'ofa'i and Will Rowlands are doing their best to 'get up to speed' with the club's tactics. The duo joined last month and made their full debuts in the 22-22 British and Irish Cup draw with Doncaster. "They'll be very good players for us and I think they've got a huge amount to contribute," Biljon told BBC Jersey. "There were teething problems, but they're trying to cram in three or four months work into one week's training." "They're doing their best to get up to speed and I look forward to future performances from them," added the Jersey boss. Tongan international Kolo'ofa'i was signed as a number eight, but has been deployed in the second row since moving to the island. "Unfortunately when you go from Saturday to Wednesday and between that time you lose four of your five second-rows something has to change," Biljon said. "I look forward to seeing him playing at eight, but we'll select according to opposition moving on from there."